Coming home from work the other day I was confronted by my seven year old who informed me that her pink Tinkerbelle bedroom theme was no longer “cool”. Two weeks and four pails of paint later we came to the result of a room that fit my seven year olds standards of “cool”. Here’s a list of ten of my favorite aspects of her room. 1) We found several old crates at a neighborhood yard sale; we painted each box a different color and nailed them to the wall, giving her colorful cubbies to display her things in. You can get colorful crates at your local office supply store as well - they are usually pretty inexpensive. TIP! Ask your local supermarket if they have any egg crates they could give you. 2) This craft takes no more than five minutes, and makes a great nightlight. Clean out a jam jar and stuff it with some straw or light fabric or even thin strands of colored paper. Take a no-flame candle, these can be found at most convenience stores or your local dollar store, and put it in the center of your jar. The end result is what looks like a jar full of lightning bugs, and it gives off just enough light for a nightlight. So cute! TIP! Another version is to glue thin tissue paper of various colors on to the jar (use a mixture of glue and water like with paper mache). Add little stickers. Very pretty glow. 3) For miscellaneous craft supplies, loose barrettes, loose hair ties, etc. - I used metal tea cases and gum containers, pretty much anything metal that would stick to a magnet, and stuck them to a large magnet board that I purchased from my local office supply store. You can also get them at Amazon. Add photos, drawings, and other momentos for a personal touch. TIP! You can try glueing thin fabric to the board to make it prettier, but make sure it's thin enough so that the magnetic properties still work! 4) Finally the solution to drawing on the walls! Home Depot sells pails of chalkboard paint for a very reasonable price, from there simply paint several layers of it directly onto your wall, and voila! This is one of my favorite parts of her room; it’s a great way for kids to express themselves without making a mess! TIP! Buy some molding from your big box hardware store and make a frame on the wall. Paint the wall inside the frame with the chalkboard paint to proudly display your child's work! 5) Make a “memory wall” in your child’s room. This takes a bit more time, but can be done lots of different ways and gives a very personal touch on the room. Dig through old family albums, search the attic, and collect any keepsakes that are flat enough to be glued or pinned to the wall. I used old photographs, tickets from Disneyland, award certificates, some of my daughters’ drawings. You can also use strips of scrapbooking paper to add design or stickers to make it a bit more fun. TIP! If you don't want to stick everything directly on to the wall, hang fun wrapping paper up as a background! 6) I grew up with glow in the dark star stickers on my ceiling, which was fun, but I took it a step farther for my daughter. I bought two bottles of glow in the dark paint from Michaels and made splattered specks onto her ceiling and walls. Let the paint charge with bright lighting for a few minuets, then turn out the lights and look up at your solar system! TIP! If you don't think you can splatter successfully, you can buy stencils at your local craft store - be creative, it doesn't have to be stars only! How about flying unicorns or spaceships! 7) Bean bags! You can never go wrong with bean bags; they’re great for watching movies in or doing homework in. I recommend Ahh! Products bean bags; they’re a bit on the spendy side, but great quality and will last from toddler years through college and beyond! 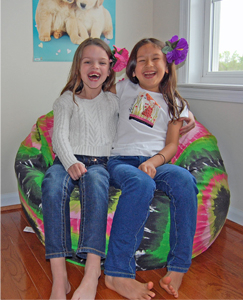 Tie Dye Bean Bags are always cool for all ages! 8) Geeks.com and Amazon has a bunch of video projectors, I found one for just under $200 that works great. Paint one wall white, set the projector up on a table, and instant home theater! Great for sleepovers! TIP! Hook up your laptop and have a slideshow. 9) Beta fish are an easy pet, and they look great in a decorative vase or fish bowl. Plus they don't need an air pump. Kids have fun designing their habitat, and no paper training or dirty newspapers will haunt you. TIP! Use a clean glass mason jar as the bowl! 10) One of my favorites... simply slide a backless dresser up against the door that leads from your kids room to their bathroom or playroom and you now have a passageway to Narnia! Soooo coooool! Thanks to a loyal Ahh! Products fan for this fabulous and creative guest post! Do you have any creative and interesting ideas to create a cool room for kids? What did you do for your children? What did they really love and use the most? I'd love to hear your thoughts!